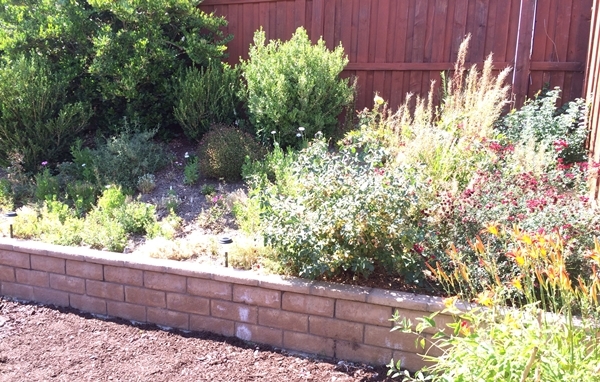 One of the things that attracted us to our new home was the berm in our back yard. It is an amazing mixture of foliage that has surprised us with new, unexpected blooms on a regular basis. It needs some effort and cleanup work, but it keeps our attention and hummingbirds enjoy it. 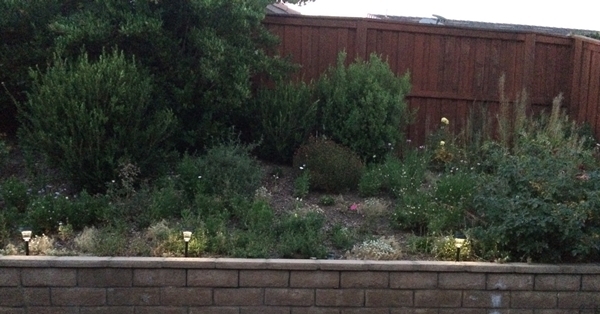 On Friday we bought solar lights and installed them along the retaining wall. It was amazing that evening to watch the lights turn on one at a time. Rather magical. It made me think of the firefly scene in the Woody Allen film Hannah and her Sisters. We’ve completed the process of covering the rocks in back with bark, and with the lights on the berm and the sound of the crickets in the evening it makes our back yard in summer an enchanted, special place.